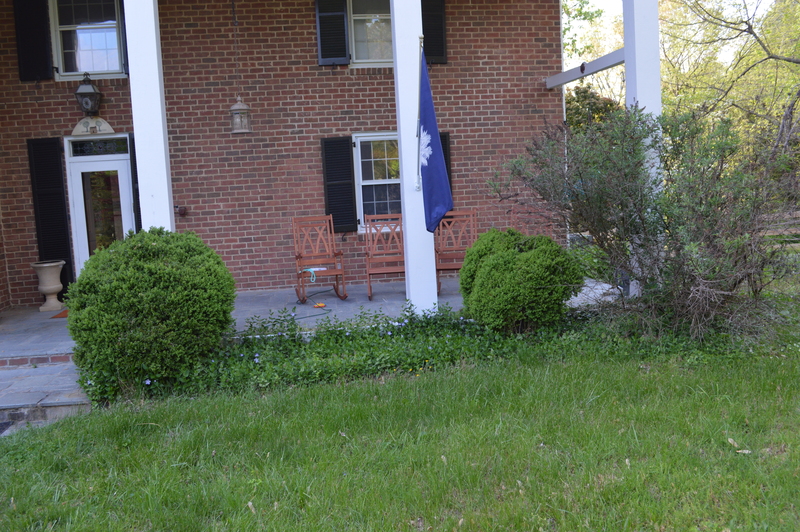 Now that the weather’s warm, we’ve started doing some yardwork in our mess of a front yard. I can’t really garden in any of the existing overgrown garden beds because they have small touches of poison ivy throughout. This is a huge disappointment to me because I gardened a lot in Alexandria and found it to be really relaxing and rewarding. So we decided to create a Lynne-friendly garden bed (even though there are literally a dozen already in existence) in the yard! 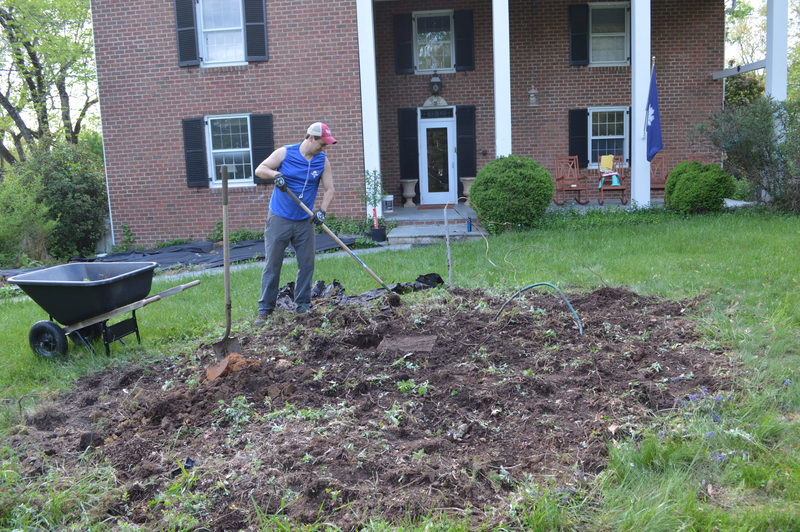 At the same time, we also decided to dig up an old garden bed in the smack dab center of the front yard. 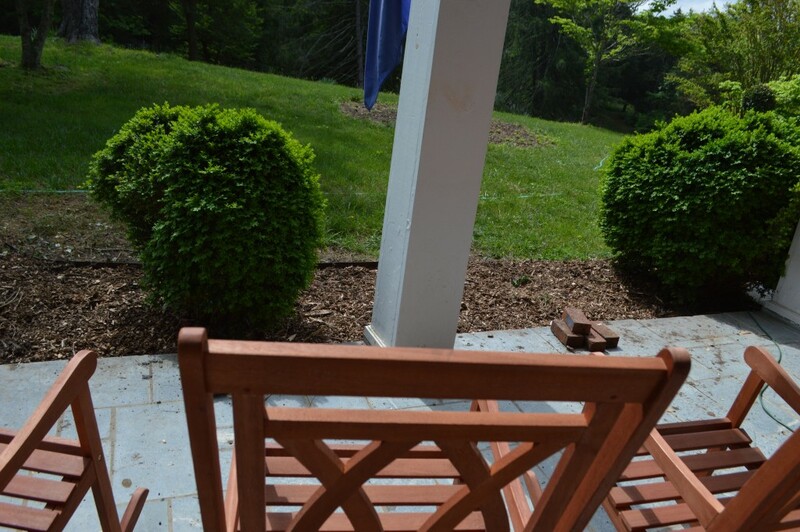 It’s got a bunch of rocks and evergreen shrubs and wasn’t adding to the curb appeal. 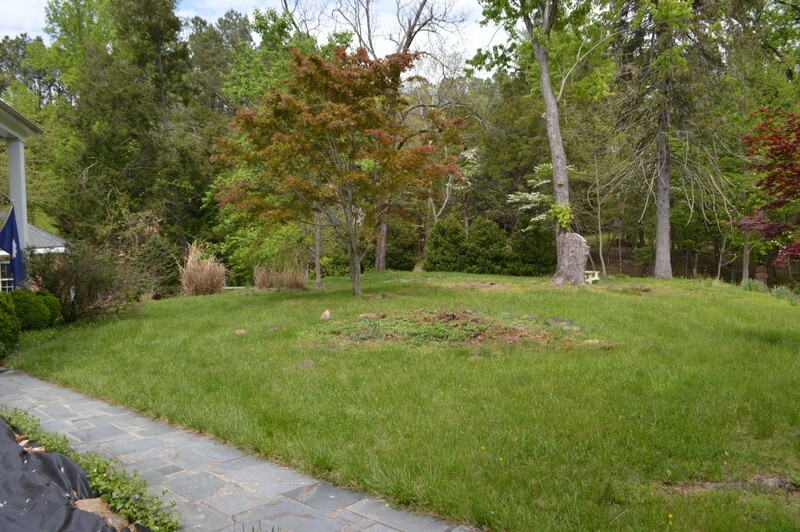 The goal is to make it part of the lawn and plant grass in its place. Lastly, we ripped up an overgrown garden bed touching the front porch. 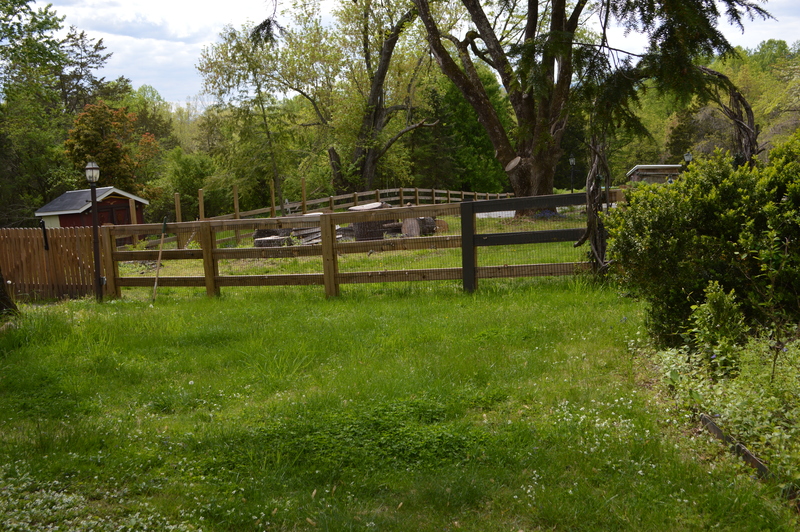 Before: the stretch of fence (partially painted, haha) going to the back yard. 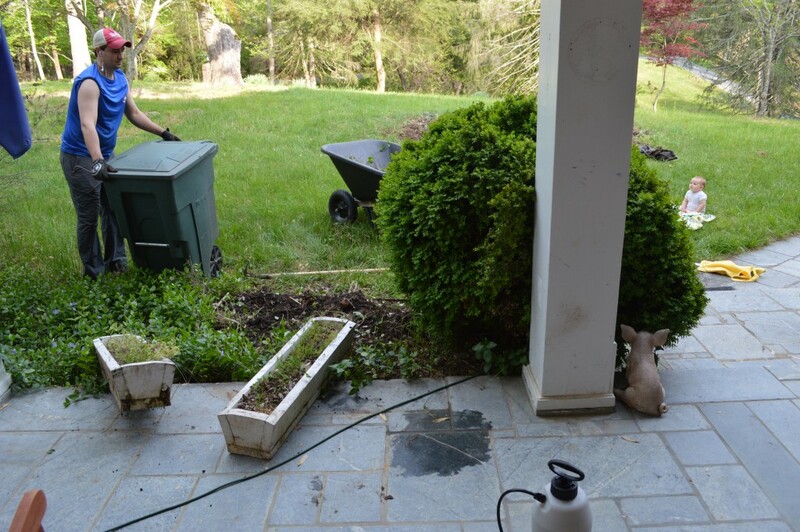 And this is that random circle of rocks and evergreen shrubs (after I had already dug up and moved most of the rocks– I took this picture mid-rock-movement). 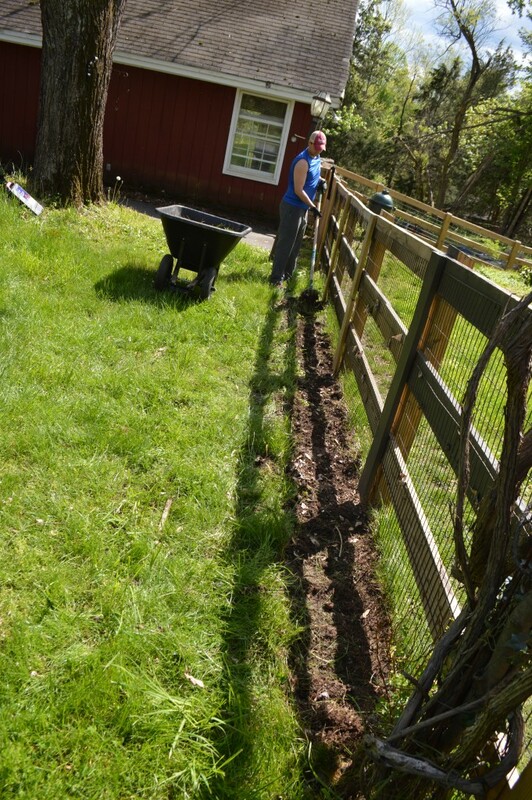 The first thing we did was dig up the grass along the fence to start a new garden bed. We decided to plant a row of lavender that we found at our Farmer’s Market. I absolutely love lavender and would love to have it surrounding my house! While we were digging stuff up anyway, we started digging in the circle in the front yard. 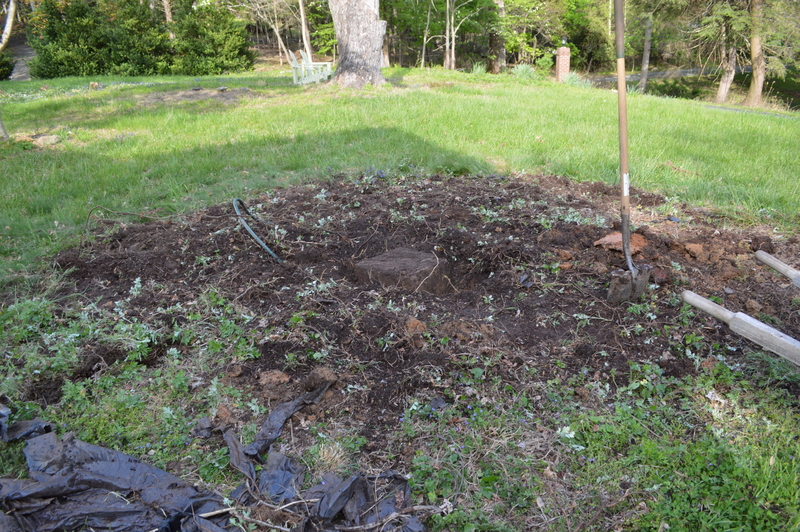 We found a bunch of electrical wires and poles under the ground– we think there used to be a fountain in the circle. 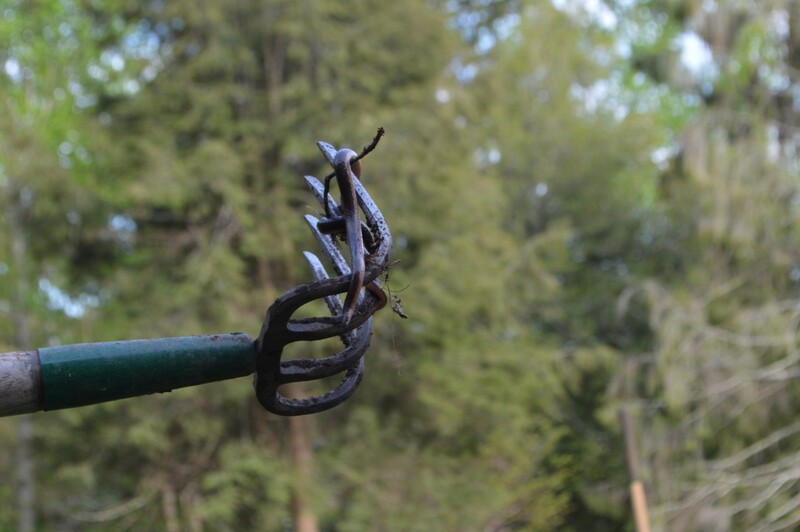 Then David quite literally dug up a little snake! 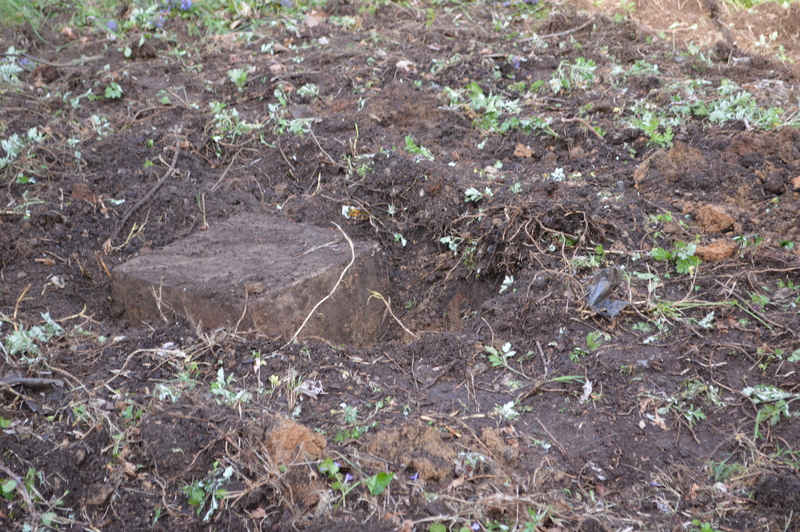 A bit more digging around the circle pulling up roots yielded a– no joke– massive concrete cube. You can’t make this up. Really, really random. Our theory is that the cube was used to support the fountain that rested on top of it. Anyone have a better theory? We also found a bunch of black tarp. Supports a theory of a water feature…? 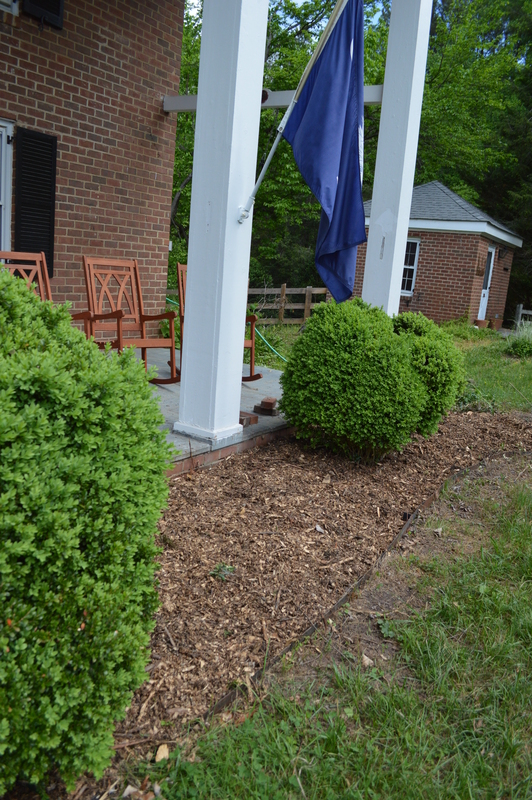 Our third project in the front yard is the overgrown garden bed touching the front porch between the boxwoods and butterfly bush. 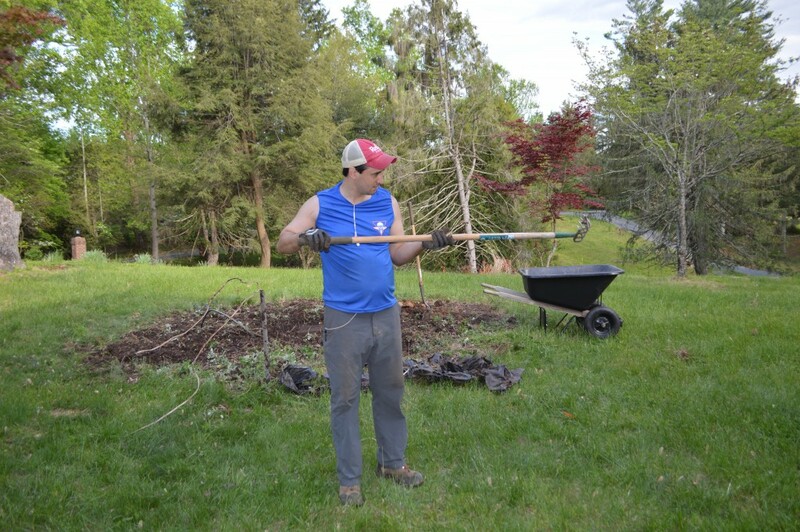 VERY overgrown, but amazingly, this garden bed shows no signs of any poison ivy, so we decided to strike while we could and rip everything up! 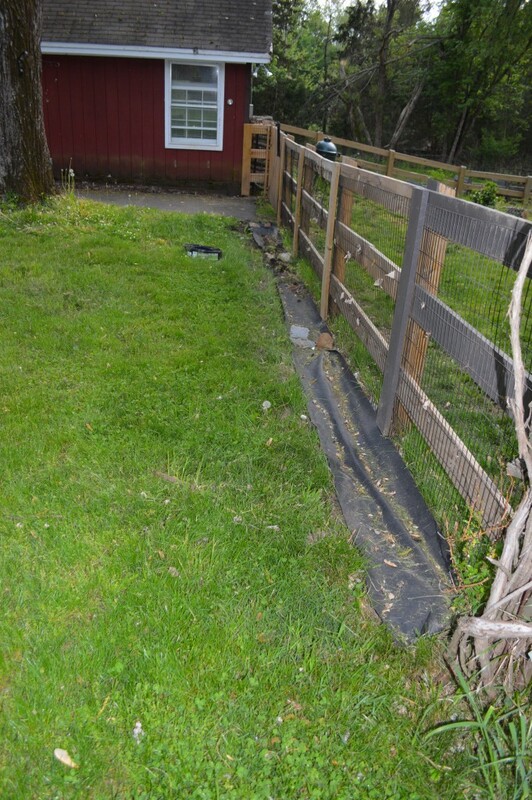 This garden bed had window boxes in the soil touching the stone. 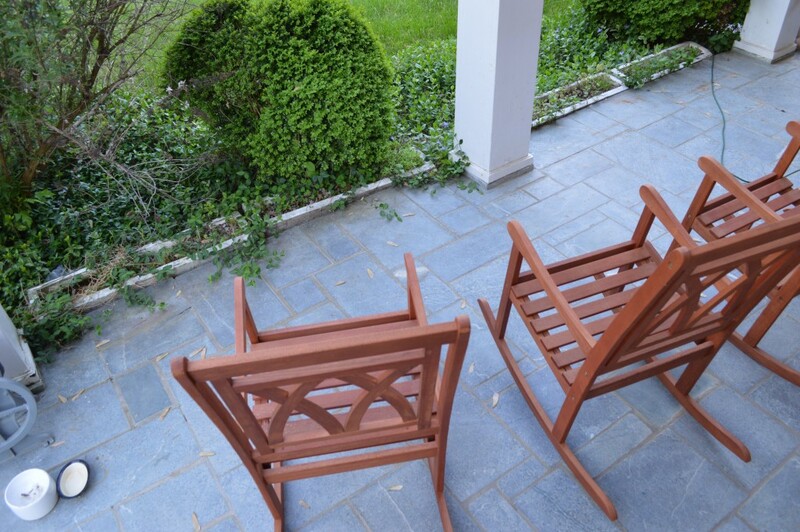 I imagine they used to be filled with beautiful flowers and it must have looked really pretty. But now it just looks scary. 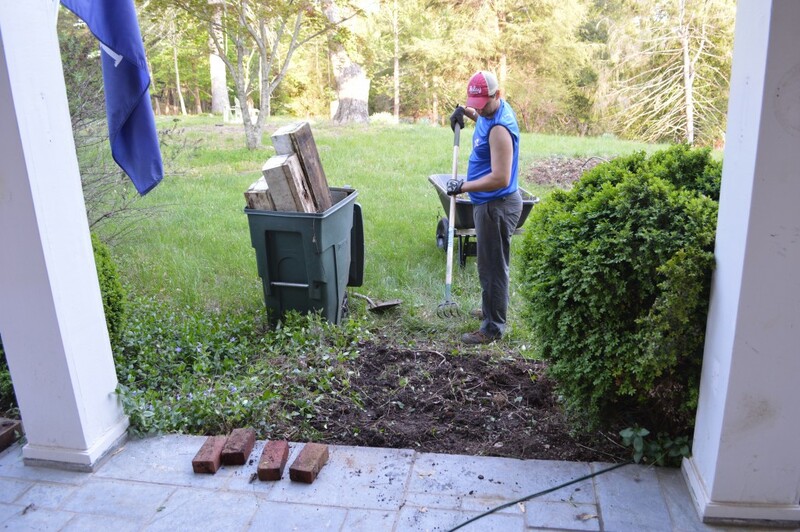 David tackled this whole garden bed himself (I helped with the other two projects) just in case there was poison ivy and we didn’t see it… I’m way, way more allergic than he is. 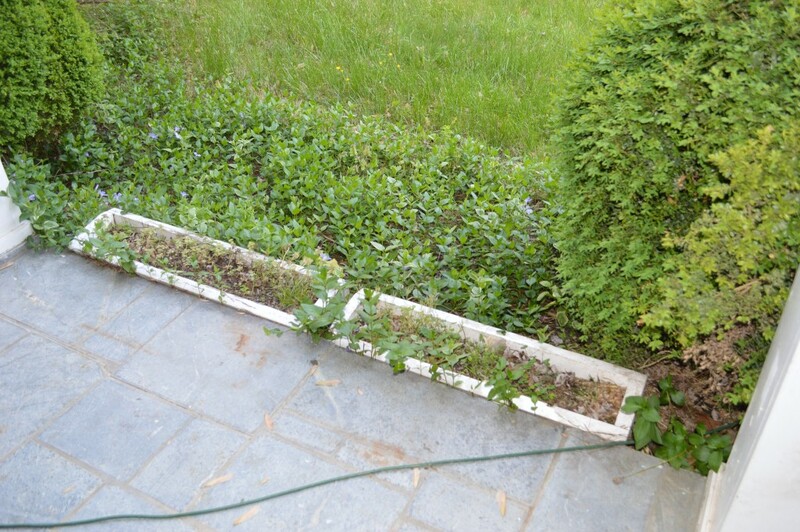 He started by pulling up the vines and removing the window boxes. 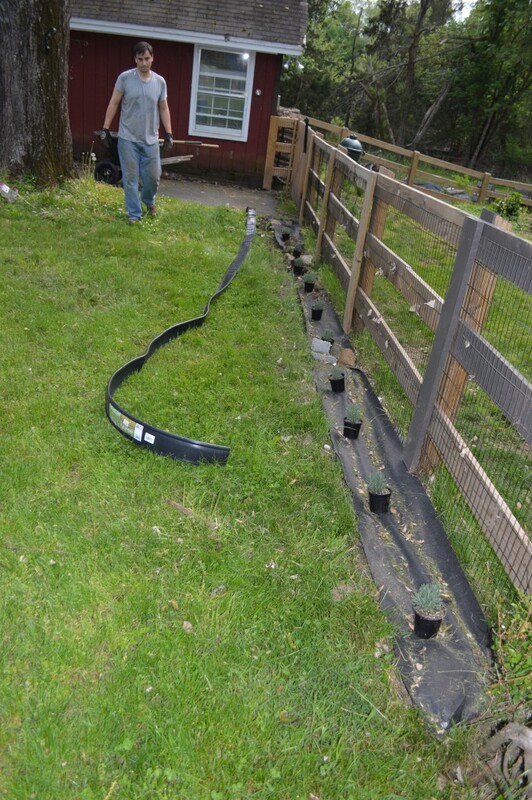 Meanwhile, back at the soon-to-be lavender row, we covered the whole row with a weed resistant cover and used spikes (they call them “staples”) to secure it to the ground. We bought an edger to line the side of the row touching the yard so that grass (hopefully) won’t run into the garden bed. 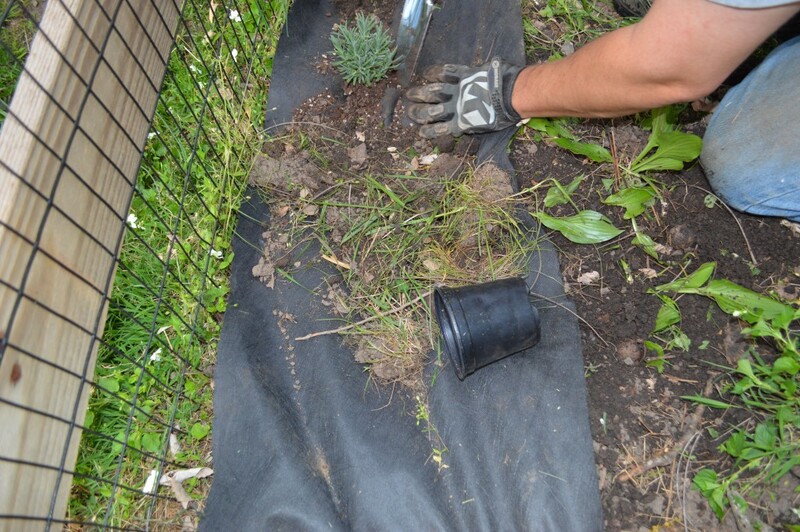 We then cut holes in the weed resistant cover for the lavender and stuck each little plant through, taking care to dig a hole in the dirt for the plant’s roots. 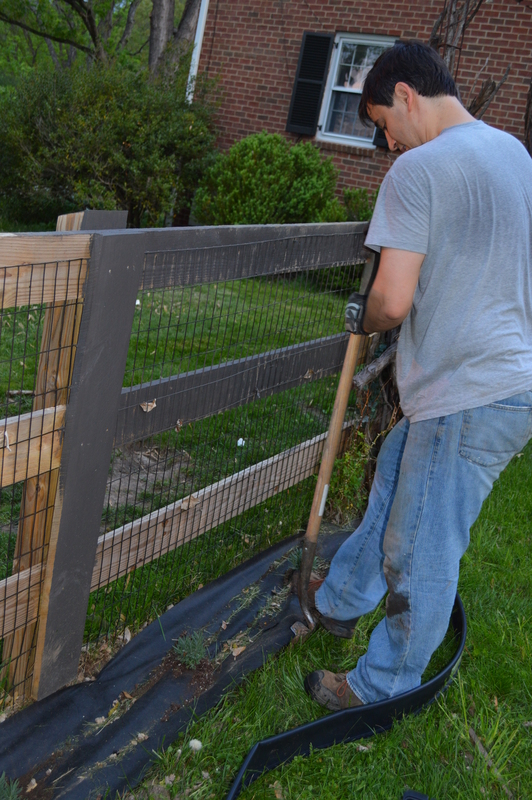 Next we used a shovel to create a space for the edger to fit. Not the best way to do this, but it worked out okay. Now behold! 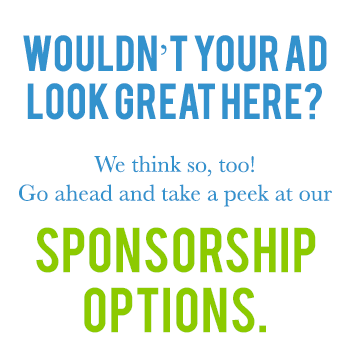 We’re making some serious progress! 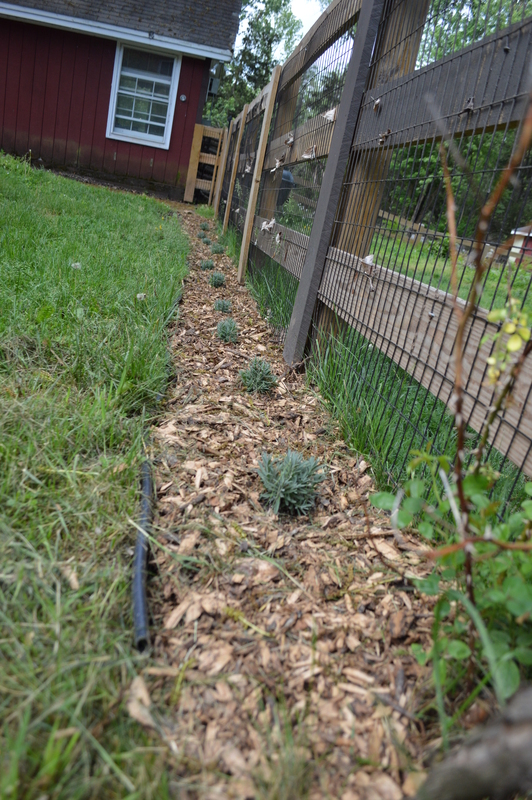 In the photo below you can see the freshly mulched (with our own wood chips from the ash tree in the back yard) garden bed by the front porch. We’re getting there, aren’t we? 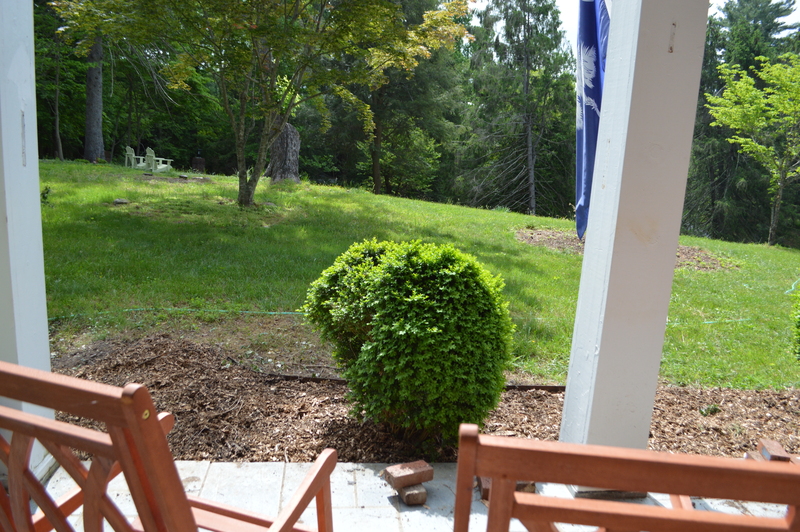 We also took down the big old butterfly bush. 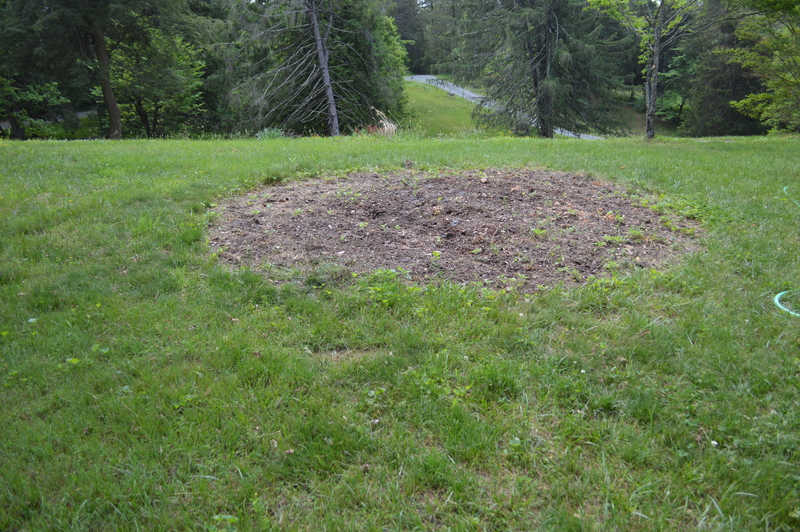 The circle in the front yard has been tilled as best as we can without renting a tiller, and we’ve planted grass seed in hopes it will soon fill in with grass.